The latest Costco "outrage" is peanut butter that's ending up in a landfill in New Mexico. It seems that Costco's old supplier of peanut butter, the Sunland plant that caused the Costco peanut butter outage last year by exposing the Kirkland peanut butter to salmonella, has again produced an unacceptable product. The plant went bankrupt, but was given a chance to recover by producing another batch of peanut butter for Costco. Using Costco peanuts, the plant produced jars that leaked. Costco refused to accept the leaky jars and demanded that they be destroyed. 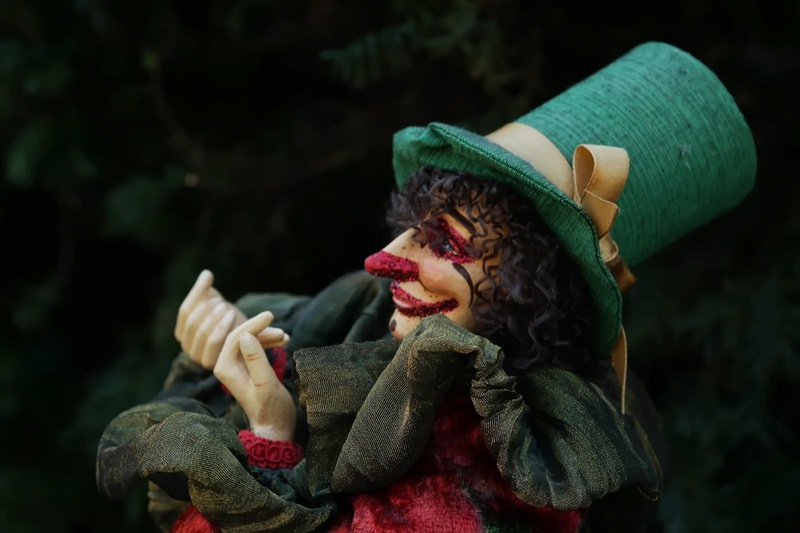 An attempt to create a point and shriek, "it's so terrible" news story has been occurring (similar to the non-story about the mislabeling of Costco Bibles). These point and shreik news stories have centered on the waste caused by destroying the leaky jars, implying that the faulty product should have been given to food banks. To me, a faulty product is a faulty product and should not be given away. I think Costco made the right call on this. In all, $2.6 million dollars worth of peanut butter, 58 truckloads, approximately 25 tons of peanut butter were placed in a landfill. Sunglass season is starting ,and I don't understand what's happening with sunglasses at Costco. Some Costcos have sunglasses on sale (Peoria), and some Costcos have very expensive sunglasses not on sale (Brentwood). I found Furla sunglasses on sale in the Peoria Costco for $44.97. I don't see this style on the Furla website, so maybe they're last season's. Don't care, like them anyway. Kirkland sunglasses were on sale in Peoria and Nashville for $22.97. This is a great price; I have these, paid full price, and like them. 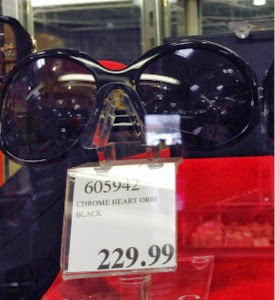 At the Brentwood, Tennessee, Costco, Chrome Heart Orbi sunglasses were $229.99; looking on-line, these sell for around $500 retail. Brentwood Costco also had Mont Blanc sunglasses for $105.99. Nashville Costco had Armani and Fendi sunglasses for under $60.00. I'm guessing the different Costcos got different selections, so if you're in the market, you might want to check and see what your local Costco is carrying. All Costcos seem to have a new sunglass product - reading glasses with sunglass tint. Sunglass readers is a great invention for those who love to read around the pool, but need the amplification of readers. For the few times that you need to read outside, this is a small investment to improve vacations. My Costco has Corvettes on Sale! 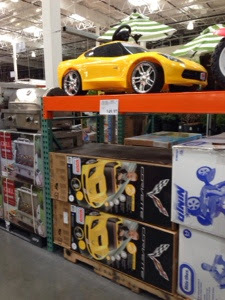 My Costco had this great little Fisher-Price Corvette on sale. I've been watching the price on this; and, when I saw it this low, we bought it for Henry. Unfortunately, Henry's parents had other ideas. We're returning. It today. There weren't many, so go quick if you want one. Ours will be returning to the Peoria Costco. 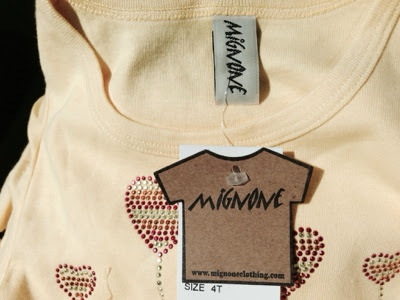 I'm sad that Costco doesn't have Hanna Andersson spring clothes for girls, but the Mignone line kind of makes up for it. These cute little tshirt dresses for $14.99 might be perfect for pre-school. I notice Nordstrom carries Mignone and the dresses sell for $46.00. Some of the Costco dresses are plain with sparky heart balloons. 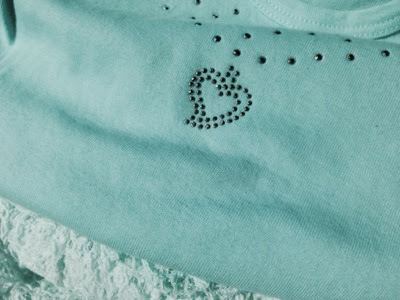 But others have fancy lace skirts. I'm hoping the tutu look might be just the thing for pre-school. Panettone are FINALLY on sale at my Costco. This happens when they don't sell out at Christmas, but not every year. Three years since I've been able to buy one on sale! The price for this 2 lb. 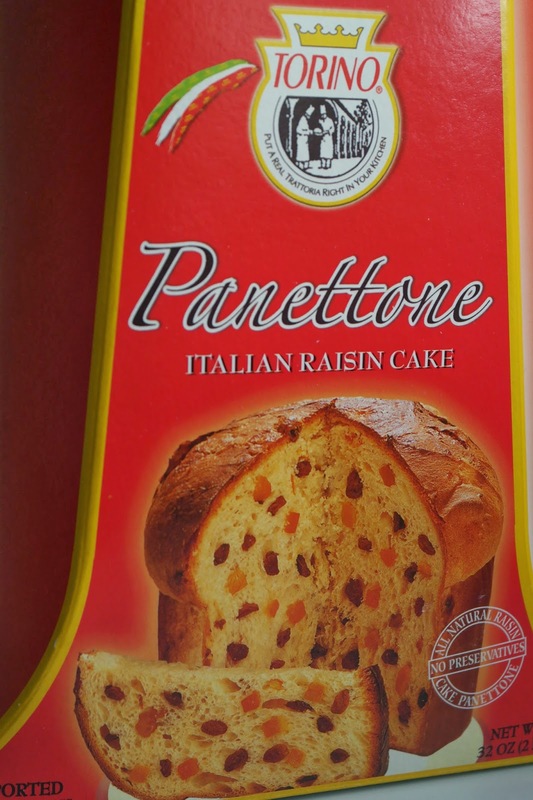 Torino Panettone before Christmas was around $6.99. Yesterday, my Costco had it on sale for $2.97. 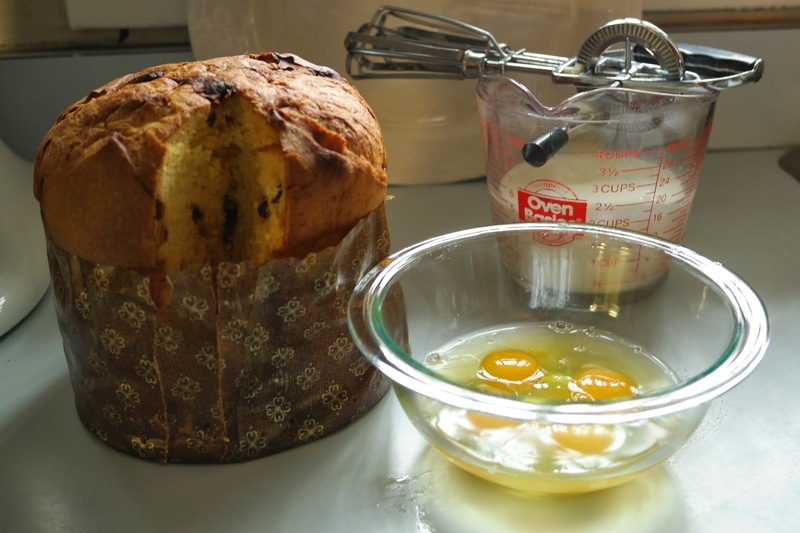 Torino Panettone, Italian Raisin Cakes, are products of Italy, associated with the city of Milan. The light leavened bread (the leavening is something like sourdough) is flavored with candied orange peel and raisins, and contains no preservatives. Traditionally, these are Christmas breads. I modified a recipe I found on-line. The bread itself is plenty sweet and flavorful for me, so I don't add any flavor or extra sugar. Whisk the eggs until frothy and mix with the cream. Stir in cubed Panettone and soak until wet. Pour into heavily buttered 8" by 8" glass baking dish. Bake for 40 minutes until knife inserted close to center comes out clean. Serve with hard sauce or ice cream. This would be a great dish at Christmas time. I'm going to check my Costco tomorrow; I think I'll buy another and freeze it for next winter. 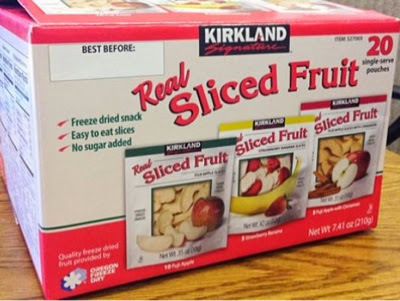 In case you missed it, and, if you purchased it, Costco has probably already informed you, but the Kirkland packages of freeze dried fruit have been recalled for potential salmonella contamination. At this point none have been sickened, but the recall includes 60,000 cases, each of which includes 20 individual packets, so potentially over a million packets are involved. 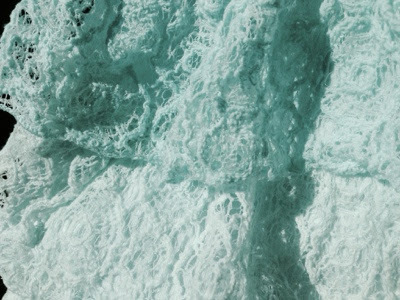 Here's a link to an explanation of the recall by the FDA. Google alerts lets me know what's happening with Costco, and the only thefts that are ever reported are from Bloomfield Hills, Michigan. Bloomfield Hills is a perfectly nice community in Michigan; I have a hard time believing that crime at that Costco is worse than elsewhere. I'm guessing that Bloomfield Hills police get so little action that reporting on the Costco thefts is a major activity for them. Most recently one man concealed candy under his coat and another tried to walk out with two televisions. I don't think the slogan on the Charlotte Heights Church of Christ on my way to Costco is fair. I exclaim, "Oh, my gosh!" when I'm surprised. When I write OMG, I'm abbreviating Oh, My Gosh. Costco Chicken Coops. It was only a matter of time. 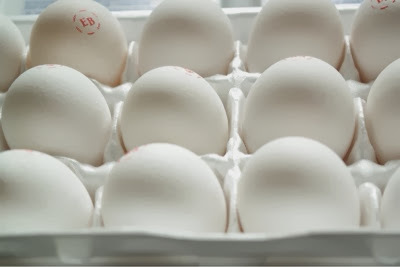 I prefer my egg containers to look like this. But sometimes great eggs come in containers like this. 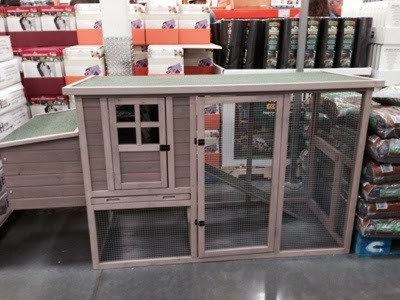 I suppose it was only a matter of time until Costco carried chicken coops. Backyard chickens are the next big thing here in #affluentWestNashville, and I'm sure they're all over East Nashville (where the hip live). I have even heard that backyard chickens are a thing in Brentwood, our local McMansion suburb, so perhaps the Costco out there has coops as well. 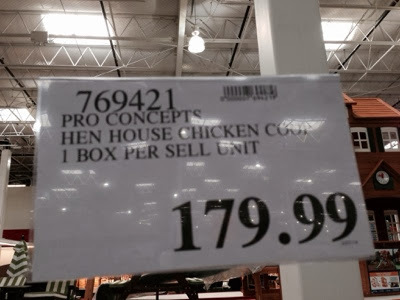 I gave up trying to figure out how long it would take me to save money if I farmed my own eggs, but at $179.99 for this Pro Concept Hen House coop, plus the cost of chickens, plus feed, a long time. Besides I've been there done that and the great problem was what do you do with the poor things when they stop laying? 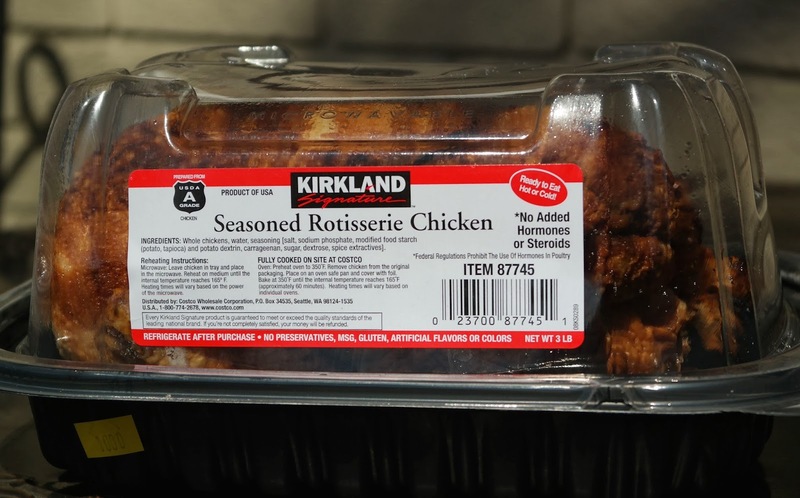 I've blogged about Costco's $4.99, loss-leader roast chicken before, it's in the news again as Costco's profits dipped the last quarter and analysts are calling the strategy into question. On the earnings call, Richard Galanti, CFO, said that Costco plans to stick with the strategy for now, but also mentioned the increase in organic products (I've blogged about this), which have a higher margin of profit and which are pulling in more young people. To judge from my family, I'm going to have to agree, it's the organic products that convinced my daughter-in-law to shop there, not the roast chicken. I love the roast chicken, and always keep one on hand, but I honestly wouldn't mind a price increase. Costco, if you up the price $.50 cents, I would still buy it. People realize that everything goes up in price, some of us can remember when McDonald's hamburgers were $.15 cents. Costco, I want you to thrive and continue to give me good deals; $.50 cents is not going to ruin our relationship. You might have noticed that Costco has replaced the Maranatha almond butter, which I blogged about before, with Brad's Organic Roasted Almond Butter, a product of Italy. This new product is much more expensive, but organic. I paid almost $14.00 ($13.69) for the jar; the Maranatha at one time cost under $7.00, but the price has been rising. At 24 ounces, Brad's Organic Roasted Almond Butter is two ounces smaller than the Maranatha jar. Brad's jar is glass, which I prefer. Sometimes the Maranatha was in plastic, sometimes in glass. I don't like Brad's as well as the Maranatha, to me, it is slightly bitter, less sweet. I think this bitterness may be the effect of roasting. Regardless, I eat it every morning on toast and sometimes as a snack on fruit during the day. Here's a Costco pear that became part of the photo above after helping me with my photography class panning exercise. Costco Photo Coupons, Samsung nx2000, Nashville State Photography Class, and Fastnacht Day! Perhaps you remember when I posted about buying a mirrorless Samsung nx2000 camera at Costco. I hope you've noticed that my photographs are getting better. I think they are. This semester I'm taking a class at Nashville State Community College that is teaching me how to use my new camera. Here's a photo I took when I didn't understand that the assignment was to photograph a background lighter than the subject. And here's a photo I took when I did the correct assignment, which was to photograph the subject against a light background. I have made a point to use the Costco photo coupons that came with the camera and with the Photoshop software I bought at Costco. These coupons give 50 free prints, so I have made hard-copy prints of my best class photos. If you have these Costco photo coupons hanging around, don't throw them away, I was told that the Costco photo coupons don't expire. And, by the way: Happy Mardi Gras! or Shrove Tuesday! or Fastnacht Day!